Alright, I think I just might have to retire this dress. It's ego is getting too big for it's own good and now won't hang out with the rest of my clothes in the closet. 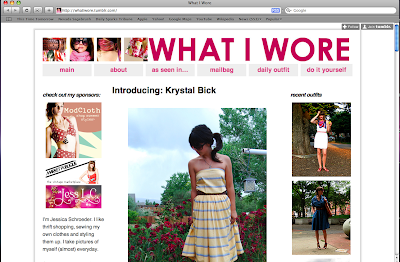 But seriously, a huge thanks goes out to Jessica Schroeder of What I Wore for her gracious post featuring, well, moi! You can check it out here. Thanks again, Jessica! Ha, I don't know about that. O yes you are! Look at all those followers you have now!